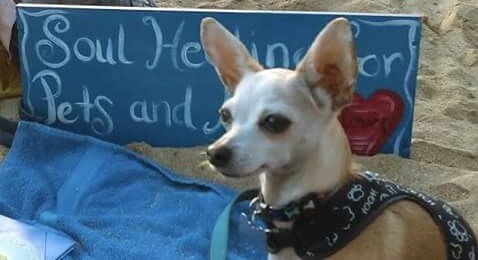 I started a group on a beach in Waikiki with my dog Mr. Ping, originally intended for mothers and children. People joined us with their pets so we changed the focus a bit to include them. We chanted there every week for months and earlier this year, a baby monk seal (an endangered animal) was born right on the city beach where we gathered. 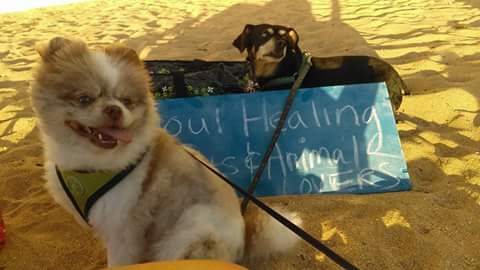 This summer we were guided to chant at a different beach park. Love, Peace and Harmony is the perfect meditation for children and animals because it is flexible and can be lots of fun. 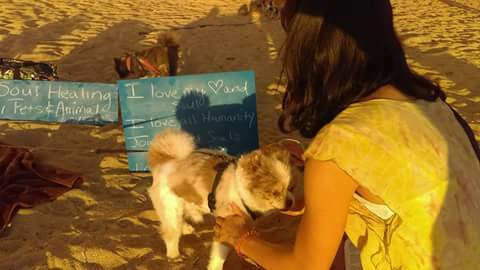 We hope many more families will join with their pets. Two brothers, who had recently returned to where they grew up in Hawaii, joined us to chant one evening. Both experienced significant relief in their physical bodies. One man expressed how calm and quiet his heart felt. He also said he received a memory of us chanting together in that very spot in ancient times. One woman asked that we chant for her daughter. The next week she shared that there had been a significant change in her daughter and their relationship. She had also noticed that her dog was much calmer and that she felt a much closer relationship with her dog. Since meditating with Love, Peace and Harmony, her life was much more harmonious and enjoyable.